Usage notes: When there’s just nothing you can do, throw up your hands with the French expression je n’y peux rien. You don’t even need to include the verb faire (to do), as it’s somehow included in peux here. The adverbial pronoun y replaces the previously mentioned problem. – Ce site-web ne marche pas ! – Je n’y peux rien, le serveur est en panne. – This website doesn’t work! – There’s nothing I can do about it, the server is down. – Je n’y peux rien, la boulangerie est fermée. – There’s no more bread. – I can’t do anything about that, the bakery is closed. Tu n’y peux rien ? – Can’t you do anything about it? Il n’y peut rien – There’s nothing he can do about it. 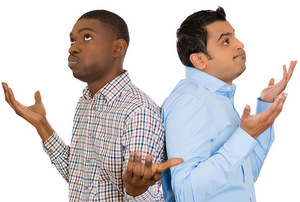 Nous n’y pouvons rien – We can’t do anything about it. 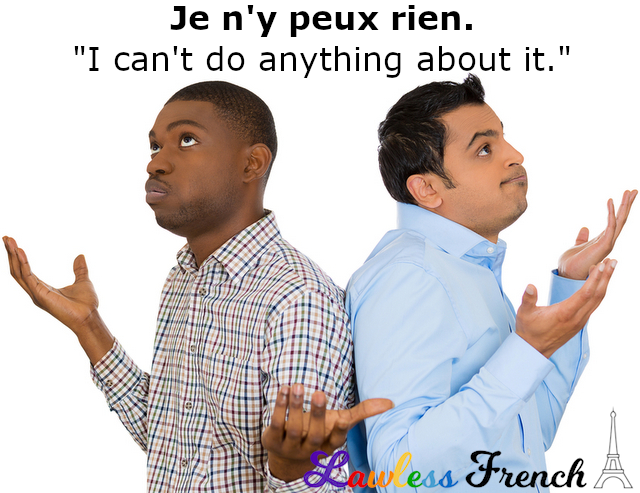 Vous n’y pouvez rien – There’s nothing you can do about it. Les enfants n’y peuvent rien – The kids can’t do anything about it.